NBC News anchor Brian Williams has been suspended for six months without pay after retracting an Iraq War story that he continued to exaggerate after first reporting it in 2003. 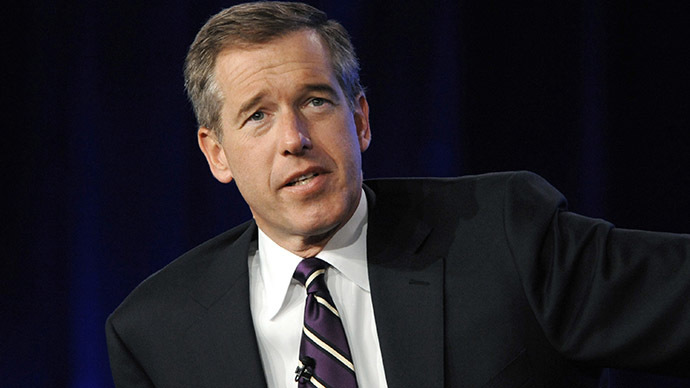 "By his actions, Brian has jeopardized the trust millions of Americans place in NBC News. His actions are inexcusable and this suspension is severe and appropriate,” NBC Universal CEO Steve Burke said in a statement. “I know Brian loves his country, NBC News and his colleagues. He deserves a second chance and we are rooting for him. Brian has shared his deep remorse with me and he is committed to winning back everyone's trust." If Brian WIlliams is suspended 6 months NBC can hire 100 producers and improve quality, right? The suspension comes after Williams, who reportedly makes about $10 million a year, took a leave of absence from the show. The controversy began during a recent broadcast, when Williams said he was onboard a military helicopter that was hit by enemy fire in 2003 and was forced to land. Little lie? Brian Williams suspended. Big lie? G. Dubya gets his own presidential library. Moral: go big or go home. His account of the event quickly came under fire from soldiers who were present that day. In an interview with the military newspaper Stars and Stripes, crew members said Williams was “nowhere near” the Chinook helicopter that was hit, nor was he near the two other Chinooks in the formation. In fact, crew members said Williams was in a separate helicopter that arrived at the scene an hour later. That wasn’t the first time that Williams had asserted he was inside the helicopter that came under attack. In March 2013, he appeared on 'The Late Show with David Letterman' and said he was in the helicopter. A few weeks before that, he did the same on a podcast with Alec Baldwin. After soldiers protested his story, Williams apologized on-air. Anger over the episode has continued to grow, however, and some of his other stories are under investigation as well.